After disasters in the United States like Hurricane Harvey, lawyers get busy with lawsuits seeking to apportion blame and claim damages. This time, a new kind of litigation is likely to appear, they say – relating to climate change. That’s because rapid scientific advances are making it possible to precisely measure what portion of a disaster such as Harvey can be attributed to the planet’s changing climate. 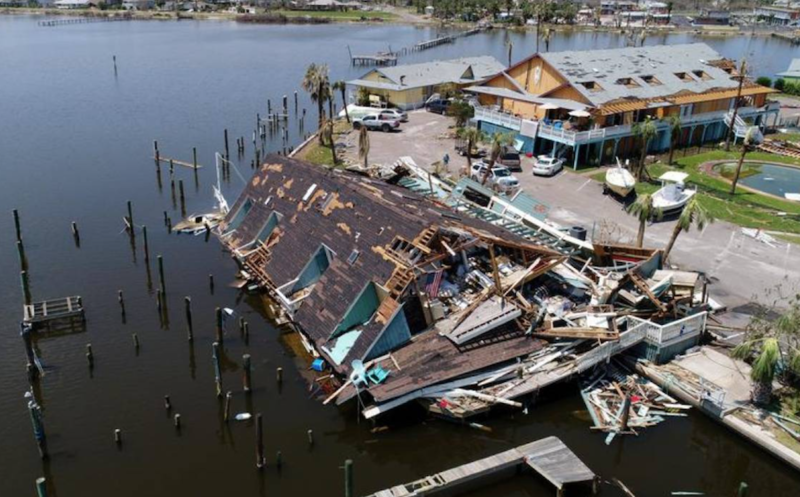 Such evidence could well feed negligence claims as some victims of the hurricane may seek to fault authorities or companies for failing to plan for such events, according to several lawyers interviewed by the Thomson Reuters Foundation. As extreme weather events and related damages and other impacts increase in severity…courts will increasingly be called upon to seek redress for damages suffered,” said Lindene Patton, a risk-management lawyer with the Earth & Water Group, a Washington-based specialty law firm. Hurricane Harvey brought unprecedented destruction as incessant rain and winds of up to 130 miles per hour caused catastrophic damage, making large swathes of Texas and Louisiana uninhabitable for weeks or months. Images of soldiers and police in helicopters and special high-water trucks rescuing Texans stranded by floodwater brought back painful memories of the devastation wrought by Hurricane Katrina in Louisiana a decade ago. The U.S. Environmental Protection Agency has rejected a contention by scientists and the U.N.’s World Meteorological Organization that the historic rainfall from Harvey was linked to climate change. Still, the dramatic scenes rekindled questions about the extent to which climate change can be blamed for such a monster hurricane, beyond broad predictions that global warming will increase the frequency of freak weather events. This time around, scientists are increasingly confident they can come up with answers. Their tool is a new science, known as event attribution, which determines what proportion of a specific extreme weather event can be blamed on climate change. It has been making fast progress over the last five years, in part due to dramatic advances in computing power, said Daniel Horton, a climate scientist at Northwestern University in Illinois who has worked on climate-change attribution studies. “The development of event attribution is a big deal,” he said in a phone interview. Last year, scientists from organizations around the world working with World Weather Attribution (WWA), a program coordinated by U.S.-based research and journalism organization Climate Central, established that torrential rain that had flooded Louisiana in the summer had been made about twice as likely due to man-made climate change. Now, a group of scientists at Oxford University in England say they plan to measure how much of Hurricane Harvey’s intensity bears the fingerprints of climate change. Their climate modeling project, climateprediction.net, is a partner of the WWA program. “There is such a high interest in Harvey,” said Friederike Otto, the lead scientist at Oxford for WWA. The process involves a network of computers performing thousands of possible weather scenario runs after data from sea surface to atmospheric concentration of planet-warming greenhouse gases has been entered in a model, she said by phone. If other WWA partners prioritize the project in their own laboratories, it could take between a few months to a year to reach a conclusion, said Otto, who is also the deputy director of Oxford’s Environmental Change Institute. The prospect of attributing portions of extreme weather events to climate change has lawyers suggesting that a new kind of litigation is emerging. For Patton, the level of certainty reached in attribution analyses means extreme weather victims will increasingly be able to seek compensation on grounds that damages they sustained were foreseeable. “Attribution science can inform that legal process,” she said. In the case of Harvey, possible lawsuits could target government agencies, companies managing infrastructure or architects and engineers who have been involved in building damaged infrastructure, from sewage-treatment plants to levees. People whose new housing development is flooded – as many have been in Houston’s metropolitan area – may, for instance, seek damages from municipal planners, she said. But in the process, between 1992 and 2010, some 25,000 acres (100 square km) of wetlands that act as natural flood barriers by soaking up rainfall have been paved over or otherwise covered, according to a 2015 study by Texas A&M University. “There could be an inquiry into whether public officials appropriately managed land use and development in a way that met their duty to their constituents,” Patton said. In that scenario, attribution science findings could serve to answer the question, “What would have happened if you…hadn’t covered over those wetlands,” she said. Insurance companies may also seek to determine if government bodies that neglected to make flooded office buildings or strip malls resilient to climate change, for instance, should be on the hook for payouts, said Patton. Other lawsuits could center around explosions at a Houston-area chemical plant after floodwaters cut electricity feeding refrigeration units needed to keep tanks of volatile organic peroxide from combusting. The fires led to calls for tougher oversight even as the administration of President Donald Trump seeks to roll back regulation. “There could be an inquiry that says, ‘Should there have been something done to upgrade the facility to be more resilient to extreme weather events?’” using attribution science, Patton told the Thomson Reuters Foundation. Ultimately, such court cases could pin some responsibility for worsening extreme weather events on to the emitters of climate-warming greenhouse gases, said Joanne Zimolzak, a partner at global law firm Dentons. The Washington-based lawyer drew a parallel with lawsuits against big tobacco companies in the 1990s. The cases ended in multibillion-dollar settlements by the tobacco industry as a consensus built around the scientific finding that an increased likelihood of lung cancer could be attributed to smoking. “That was a linchpin in actually holding these companies responsible,” Zimolzak said in a phone interview. At Columbia University, Michael Burger, executive director of the Sabin Center for Climate Change Law, said that current lack of consensus over the accuracy of attribution science could, however, prove a hurdle in courts for now. Thomson Reuters Foundation produces journalism on climate change, humanitarian issues, resilience, women’s rights, trafficking and property rights. The foundation is the charitable arm of Thomson Reuters, which includes the Reuters news agency.